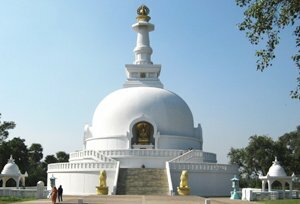 A famed tourist destination in the Indian state of Bihar, Vaishali is deemed to be the embrace of people of two main religions of India which are Buddhism and Jainism. It is a small village that offers so many attractions that one must not give a miss during the tour to Vaishali. There are various places of Buddhist interest encompassing Ananda Stupa, Kutagarasala Vihara and relic Stupa. Moreover, heaps of Jains throng to this place every year as the place is said to be the home of Bhagwan Mahavira. One can also explore the very old architectural beauty in this village standing as evidence to era of yore. Deemed to be the first republic in the globe, Vaishali is a splendid holy place of both Buddhists and Jains. The place is steeped in history and has appealing myths that draw the tourists from all across the world. Named after King Vishal of the Mahabharata time, some experts said that the name of this village was given owing to its richness. He is believed to have erected a magnificent fort in this place, which has remnants now. Lord Buddha had also spent some time here and it was here that he given his last sermon before he passed away. When Gautam Buddha would come for a visit, it was a city full of surprises, fun and entertainment in ancient times. 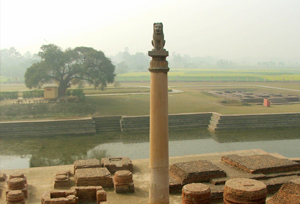 To honor the trips by Lord Buddha, King Ashoka built renowned lion pillar in Vaishali. Ashoka Pillar: One of the renowned destinations of Vaishali located in proximity to coronation tank, Ashoka Pillar is a lion pillar constructed by King Ashoka. There is also a brick Stupa close to it which is believed to honor the last sermon of Lord Buddha. Bawan Pokhar Temple: A Hindu shrine positioned on the northern bank of a tank called Bawan Pokhar, Bawan Pokhar Temple was constructed during Pala period having beautiful pictures of Hindu gods. The pictures of gods and goddesses date back to Pala period. Abhishek Pushkarn: Deemed to be blessed in the yesteryear, Abhishek Pushkarn also known as Coronation Pond contains the ashes of Gautam Buddha. Raja Vishal's Garh: Said to be an old parliament house, Raja Vishal's Garh is a highly visited attraction in a beautiful town of Vaishali. One must visit it during the tour to take back superb memories that one will love to cherish for a long time. Kundalpur: Known to be the hometown of Lord Mahavira, Kundalpur is situated at a distance of 2 miles from Vaishali. He is said to have stayed for 22 years in Kundalpur. Vaishali Museum: Exhibiting a few of the archaeological leftovers, Vaishali Museum was erected in 1971 and has four galleries displaying different items of ancient times. By Air: The town doesn't have its own airport. One can get down at Patna airport to reach Vaishali connecting many famous cities of India by daily flights. By Train : The closest railhead is at Muzaffarpur that connects to Ahmedabad, New Delhi, Hatia, Howrah, Mumbai and Jamshedpur by trains..